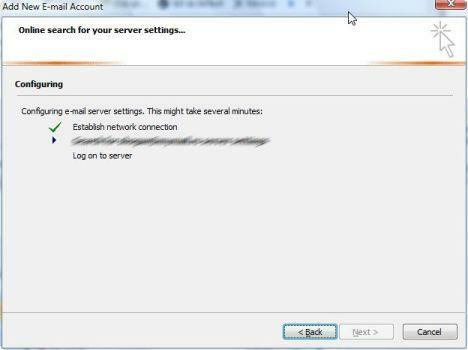 How to find the e-mail server settings? Before you configure Outlook 2007 to get your e-mail messages, you need to know what connection settings to use. Go to the help pages of your e-mail provider and search information about how to access your messages using an e-mail client. Usually most mail services use POP3 as the protocol for retrieving your e-mail. Search for the words POP or POP3 and you might find the information you need. The major providers of e-mail services generally offer very detailed information about how to configure your e-mail client in order to connect to their servers. If you are using Gmail, check out this guide. For Yahoo Mail Plus, go to this page. People that use Microsoft e-mail services don't need to know their e-mail server settings because Outlook 2007 is capable of connecting automatically. You will need to fill in your name, e-mail address and password and Outlook 2007 will detect the rest of the settings for you. If you are using other services, you might want to check out this page. Here you can find information about other important e-mail services such as Lycos, AOL, Mail.com, Netscape, Tiscali, FreeServe and Supanet. 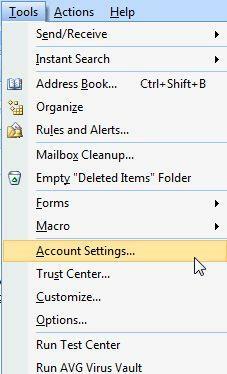 Start Outlook 2007, go to the Tools menu and click on Account Settings. 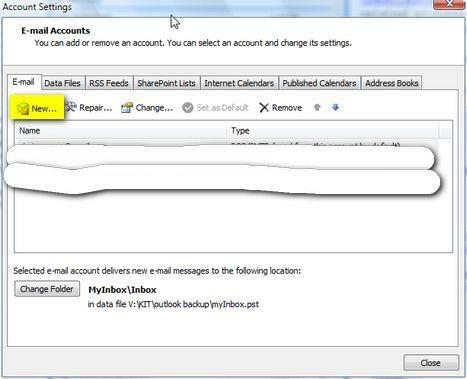 In the Account Settings window you can configure all your e-mail accounts. To create a new account click on the New button. The Add New E-mail Account wizard will start. 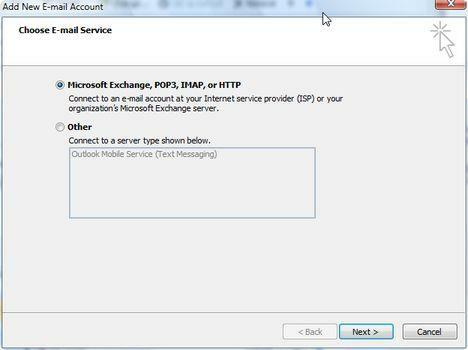 Select Microsoft Exchange, POP3, IMAP, or HTTP and click on Next. In the next window type your name, e-mail address and password. If you are using mail services from Microsoft such as Windows Live Hotmail, you can press the Next button and Outlook 2007 will automatically detect your e-mail server settings. 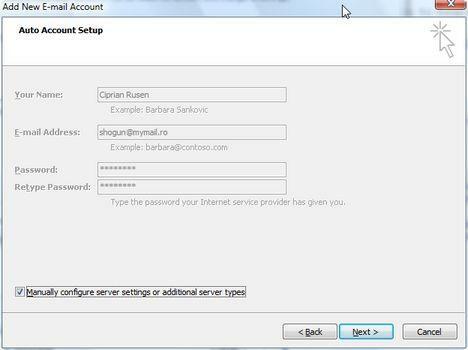 If you are not using any e-mail services from Microsoft you will need to configure your server settings manually. 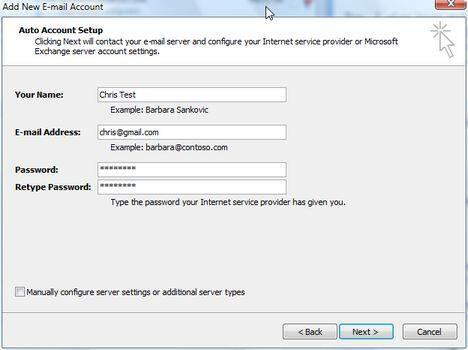 To do this, in the Add New E-mail Account window, check the box that says Manually configure server settings or additional server types and click on Next. In the next window you need to choose the type of mail server your e-mail service is using. 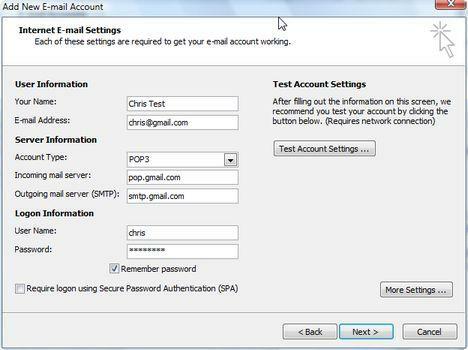 In this tutorial we will cover the first option - Internet E-mail (POP, IMAP or HTTP). Now you need to enter all the settings required to connect to your e-mail server. First type your name and e-mail address. 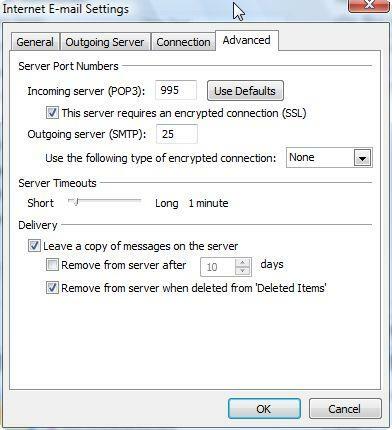 Then choose the appropriate connection type: POP3, IMAP or HTTP. Next, type the incoming and outgoing mail server addresses and then the user name and password used to connect to those servers. There are cases when you need to make some additional settings. In this case press on the More Settings button and the Internet E-mail Settings window will open. Here you have several tabs with different settings. The most important tabs are Outgoing Server and Advanced. 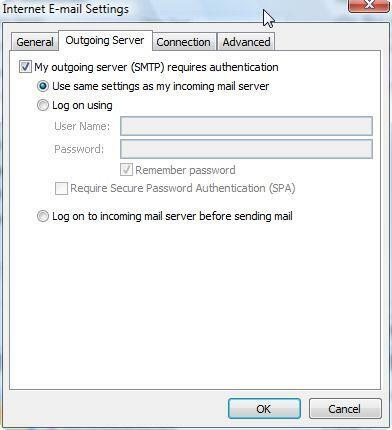 In the Outgoing Server tab you can configure the way Outlook connects and authenticates to the outgoing (SMTP) server. In the Advanced tab you can set the ports and you can enable the encrypted connection between your PC and the mail server. If your e-mail provider offers a generous inbox (1 GB or more) it is a good idea to check the Leave a copy of messages on the server. This way, if you have any problems with your PC and you lose your e-mail messages, you will always have them on the mail server and you can download them back once your PC is repaired. By default, Outlook 2007 does not have this option enabled. Another recommendation is to also check the 'Remove from server when deleted from Deleted Items' option. This helps you optimize the space used on your mail server by deleting all the undesired messages. When you are done making all the required settings, click on OK to return to the previous window and then click on Next. 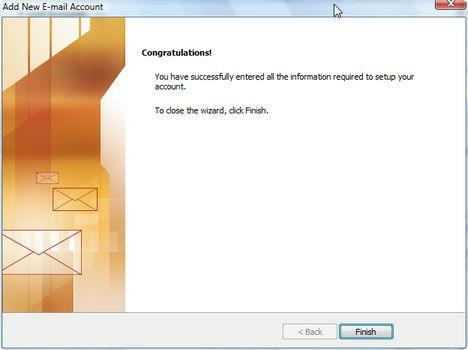 The wizard will now end and show you a congratulations message. Click on Finish and you are done. If you've made all the correct settings, you will be able to retrieve your e-mail messages. How can i get the incoming mail server and outgoing mail server if I'm using hotmail? I get the same prompt for password all the time. Did you find a solution to that? I am using Outlook 2007 on Vista and yahoo mail. Did you got the solution for Ms outlook 2007 vs yahoo configuration? Error message 'getting prompted for a password'? 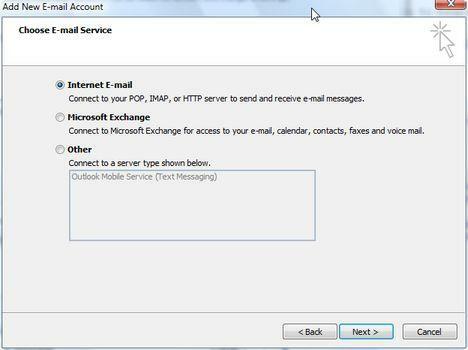 Do you know how can I configure or set up my AOL via IMAP (NOT POP3) with my Outlook 2007? •Be sure to include the @aol.com or @aim.com suffix. •Check the box for leaving messages on the server. •The outgoing mail (SMTP) server address is smtp.aol.com, port: 587. •Your user name is your AOL or AIM screen name. •Your password is your AOL or AIM password. Im using gmail thru my outlook, OPS is Vista premium, my receipants are receiving multiable emails from me and I cant seem to stop it. I'm running Mcafee and have downloaded the fix for vista on that and its still happening. My Outlook will not open attachments. I end up sending it to another client to open it. Same as the person who posted months before, I've set up everything according to the site but it keeps prompting me for a password therefore I can't get incoming or outgoing mail in Outlook. I previously had Outlook 07 and Hotmail configured and it worked well. My laptop wasn't turned on for about 3 months. Now it won't update my Inbox. When I try to register again using the above instructions, it doesn't work. Then prompts to do a unencrypted connection which doesn't work either?! I just bought a new laptop with Vista Home and when I try to set up an email account there is no selection for exchange server. Only POP or IMAP. Do I need to have Vista Business to do this or am I missing something? I've done all the settings above but I cannot send or reed my emails in outlook 2007. it's still telling me to type my user name and password. I have windows vista ultimate software and i don't know what to do now. You wrote one of the servers incorrectly, your username or password or, maybe, the service you are using does not support you retrieving e-mail on your computer and you can only access it from your browser. When opening Outlook, it goes to configure Outlook for the first time and it's trying to configure it with an Exchange Server. It needs to be configured for a myfairpoint.net account. How can I fix this issue? When you cancel it out to get away from this window it closes outlook completely and when you reopen Outlook it goes back to configure with and exchange server again. Need help fast, thanks. I would like to use Outlook 2007 to read my AOL email. We have Cox as our internet service provider. What are the parameters to set up my mail in Outlook 2007 using Cox with an AOL email address. We live in Arizona. I need the incoming and outgoing info and the number for the outgoing and incoming server. Can't find an answer to this one yet: I'm trying to transition from an AOL account I've used for many, many years to an email address from my company domain, and thought that one way to facilitate this transition would be to set up Outlook 2007 so that whenever I reply to a message received through AOL, the reply would come from the company domain email account. Is there a way to set up Outlook 2007 so it will do this automatically? Or must I manually change the account from which the reply will be sent every time I reply to a message? I have Outlook 2007 set up with both the AOL and the company domain accounts.